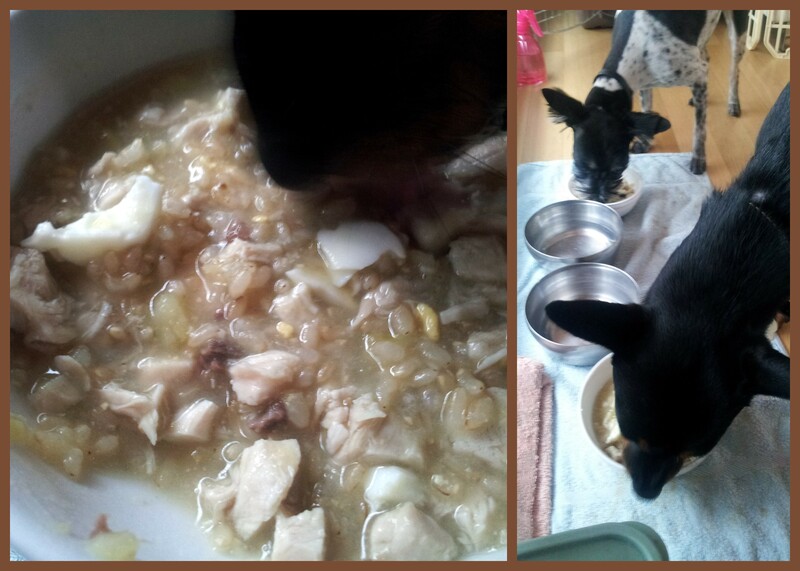 Mama’s home cooking: chicken and sweet potato stew (and Orijen dog food) | I Heart Webby! Fortunately, since then I’ve discovered a great website, www.dogfoodadvisor.com which gives a very informative breakdown of commercially available wet and dry dog food. I’m very glad that I made the switch from a 2 star kibble to a great 5 star kibble: Orijen. Since Orijen, I’ve noticed my dogs have shinier coats, and it is a great comfort to know that I’m feeding them something made of human-grade ingredients. I’ve even had a few adventurous friends taste test a kibble pellet when I told them this. Now that’s confidence in a product! Of course, I put in my order right away, but I knew I’d have two days without any kibble…LUCKY DOGS! Why? Because in the meantime, my dogs are getting some home-cooked loving in the form of chicken and sweet potato stew! As you can see in the picture above, they were both very happy campers! Of course, I don’t intend for this to be a long-term meal replacement (which I do not recommend without supplemental vitamins and minerals added in), but it is a wonderful opportunity to turn my forgetfulness into a rare treat! Posted by mz jenny lee on November 23, 2012 in Dog food, Reviews and tagged dog food, homemade, Hoochoo, kibble, Orijen, recipe, Webby.